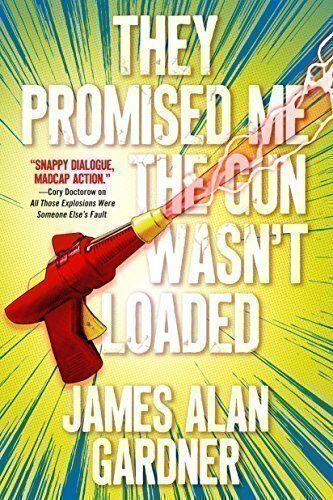 Award-winning author James Alan Gardner returns to the superheroic fantasy world of All Those Explosions Were Someone Else’s Fault with They Promised Me The Gun Wasn’t Loaded. Only days have passed since a freak accident granted four college students superhuman powers. Now Jools and her friends (who haven’t even picked out a name for their superhero team yet) get caught up in the hunt for a Mad Genius’s misplaced super-weapon. But when Jools falls in with a modern-day Robin Hood and his band of super-powered Merry Men, she finds it hard to sort out the Good Guys from the Bad Guys—and to figure out which side she truly belongs on. Especially since nobody knows exactly what the Gun does . . . .